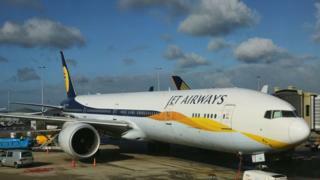 The founder of cash-strapped Indian airline Jet Airways has stepped down as chairman of the company. Naresh Goyal's resignation is likely to pave the way for potential investors to save India's oldest private carrier. They were held back by Mr Goyal's reluctance to give up control of the company, reports say. Jet's debt exceeds $1bn (£750m) and the airline has grounded some flights as it is struggling to pay employees, suppliers and leasing companies. Within minutes of Monday's announcement, the company's stock jumped 12%. It also said that the banks would convert the debt they are owed to equity, reducing Mr Goyal's controlling stake in the company. Mr Goyal and his family currently own 52% of the airline. It's unclear how much they will eventually retain but they will lose their majority stake to the banks. In recent weeks, it had grounded more than two-thirds of the 119 aircraft in its fleet. Thousands of flights were cancelled, affecting passengers flying on both international and domestic routes. A pilots' organisation had also warned that its members would stop flying for the carrier if their salaries were not paid by the end of March. Mr Goyal was at the "heart of the crisis", according to the BBC's Sameer Hashmi, who says his refusal to step down had prevented investors from pumping money into the airline. It even ended a potential deal with Etihad Airways, which owns a 24% stake in Jet, and agreed to invest more and take control of the airline, our correspondent adds. It happened again when India's largest conglomerate the Tata group showed interest in buying the airline, but stepped back when Mr Goyal refused to resign from the board. There were also news reports that the Indian government had urged state-run banks to save the carrier as it wanted to avoid job losses ahead of a general election.